Aesthetic appeal is obviously very important. No one wants an ugly fence. It needs to be functional, but attractive. Your fence needs to comply with local laws. According to the U.S. Consumer Product Safety Commission an estimated 260 children under the age of 5 drown each year in residential swimming pools and spas. Another 3,000 children are treated for injuries sustained from submersion accidents. The solution: invest in a Child Safety Fence. The vertical pickets should be no more than 4″ apart. The fence should be no less than 4ft tall. Some counties require pool fences to be 5’ or even 6’ tall. Horizontal framing should be inside the pool fence to prevent climbing. Check with your local building code agency or local officials for a full set of guidelines. 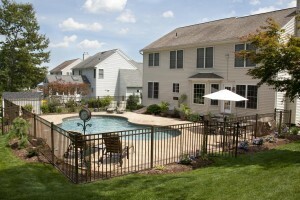 Mid Atlantic Deck & Fence can design and install a high-quality child safety fence around your pool or spa. We take great pride in what we do. From our company trained designers and installation experts to our incredible service department, we guarantee you piece of mind every time. Wood: Cedar and pressure-treated pine fences are an aesthetically pleasing and durable pool fencing option. Because they are naturally resistant to insects and moisture, cedar and pressure-treated fencing are excellent options for your pool. Metal: Aluminum and steel fences offer a more durable, lower maintenance option than wood. Vinyl: Vinyl fences, meanwhile, are incredibly easy to care for and tend to last longer than their wood counterparts. If you have any questions about Child Safety Fence installation throughout Maryland, please contact Mid Atlantic Deck & Fence (MAD Fence) today by clicking here or calling 1-800-833-9310. You can also follow us on Facebook and Twitter as well.